Algal treatment of biogas digestate is an innovative approach for biogas plants in search of improved quality of digestate liquid fraction, energetic substrates (feedstock), recycling CO2 emissions, effectively use of excess heat and reduction of odour. Nutrients from digestate can be recovered and cycled on site. 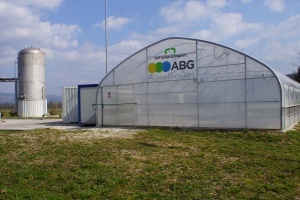 There are several thousand biogas plants throughout Europe and the number is still rising. Different technologies and different substrates are used but all of them have some common challenges. Beside optimization of biogas and power production, they are always in search of affordable highly energetic substrates (feedstock), effective use of the heat produced, and disposal or even monetization of the resulting digestate. Digestate can be directly applied after production to the nearby agricultural land, however, an accumulation of biogas plants in certain regions and their increasing number leads to an oversupply of digestate. The digestate needs to be transported to regions with nutrient deficits or otherwise processed. The transportation to distant areas causes logistical problems because the digestate consists of 95% water. Spreading is usually restricted to a few months in a year. In winter time it is normally not permitted as excess precipitation during these months can cause the fertiliser to run off the land and potentially contaminate local water sources. Big storage capacity is needed to buffer the digestate. If sufficient land area is not available, digestates have to be pretreated (e.g. sludge separation, NH3-separation, dewatering) before further use. Solid fractions are often separated from the digestate to undergo further composting. The separated liquid fraction of the digestate is in some cases partly re-circulated for substrate homogenisation or further processed i.e. aerobically purified. Digestate specific intense smell also negatively influences the quality of life of nearby population. By algal treatment of biogas digestate, we can improve quality of digestate liquid fraction (liquor), produce algae which can be used as an energetic substrate or processed in bio refinery, recycle CO2 emissions, effectively use excess heat and reduce odour of digestate. 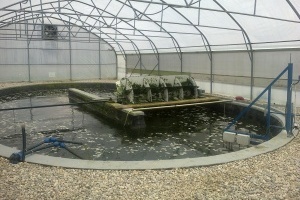 Nutrients can be recovered and cycled on-site. Algae hold great potential for energy use because of their growth rate, easy production and better utilization of sunlight compared to conventional plants, shorter lifecycles and independence from fertile agricultural land. Biogas plants are rich sources of mineral nutrients, CO2 and heat.